Djinn - ZineWiki - the history and culture of zines, independent media and the small press. 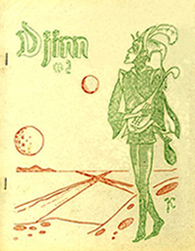 Djinn was a science fiction and fantasy zine edited by Van Splawn in St. Louis, Missouri, U.S.A.
Two issues appeared in 1952. The first issue was published in February 1952, and distributed by the Fantasy Amateur Press Association. It was 8 pages. The second issue is dated August 1952, and was included in the 60th mailing of the Fantasy Amateur Press Association. It was 12 pages, and included articles and fanzines reviews by Splawn, and cover art and interior illustrations by Kraushaar. One issue of Djinn was a split issue with another of Splawn's fanzines, the second issue of Soma. Splawn was a prolific editor from the mid-1940s to the mid-1950s, whose other fanzines included The Fantasmith, Fantascience Fan, Mars,The Outlaw, Prometheus, Sevagram, Soma, The Star Rover, Symphony, Time Stream, and Worlds Apart.